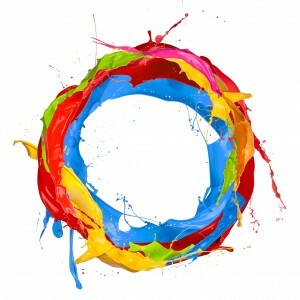 What do you think of when you see a circle? How about a rectangle? Or a vertical line? You probably say, “I don’t think of anything,” but that isn’t true. Shapes, like colors, spark thoughts and emotions in our subconscious. When they are combined wisely, they create a powerful symbol. In marketing these symbols are called logos. They are like the royal banners of medieval times that signified a powerful family, or a weak one. A logo not only identifies the company, it also tells consumers and clients what the company’s ideals are. A good logo can make a company look powerful, trustworthy, or even delicious, and can bring in business on its merits alone. The first step to a strong logo is choosing an appropriate shape. We could discuss how it needs to be versatile or identifiable, but the focus of this post is the psychology of shape. Psychology is “the way a person or group thinks.” So we are talking about the way a person or group of persons thinks about the shape of a logo. Whether you want it to or not, a logo will convey a meaning. People will interact with it just as much as if it were a written statement. Think about this: Ernst & Young spent thousands of dollars last year to redesign their logo. Mark Weinberger, the new global chairman and CEO, said, “Our new brand name and logo demonstrate clearly and boldly who we are and reflect the goal we have recently set for ourselves to be the number one brand in our profession.” Ernst & Young, or EY now, is a top accounting firm and that’s how important a logo shape is to them, thousands of dollars worth. Here are some ideas to get you started on your power logo. Geometric forms include squares and triangles. These kinds of shapes are grounded, strong, and efficient. They can also be uninviting. Choose your color wisely and think of putting the shape on a slant. Free Form or Abstract are creative and fun. Often they are an organic or geometric shape in a very stylized version. Organic is shapes found in nature like plants and geology. They are comforting and add interest to a logo. Horizontal implies tranquility and rest, while Vertical suggests masculinity and strength. Take note how the shape of your font — angular, serif, curved, or casual — gives meaning to the words you choose. It’s okay to get really into the details when you design a logo. Every detail communicates a message. Test your logo to see if it can easily remind a viewer of something completely unrelated to your message or even something inappropriate. Make sure that it can be applied to a variety of mediums and keep its identity. Can you recognize it from far away or does it blend together? And remember, less is more. Don’t clutter your image. Streamline it and you will send a visual punch to viewers.